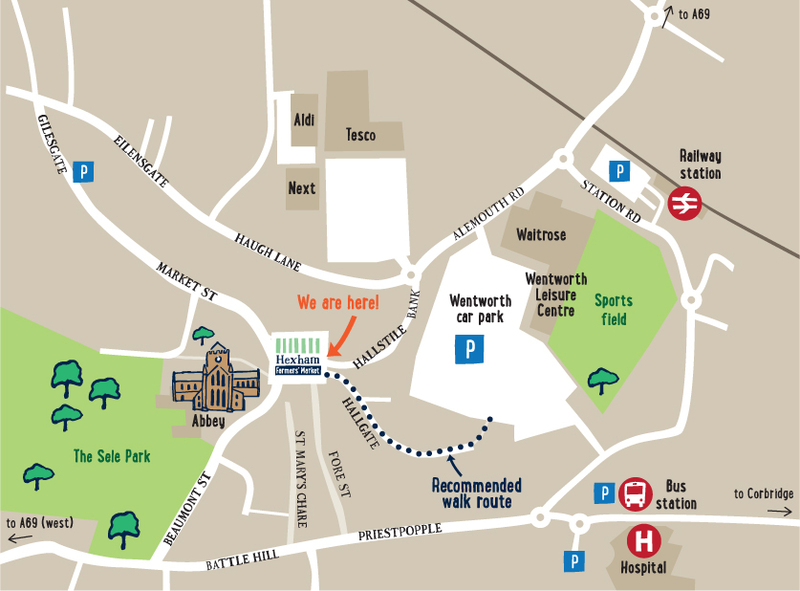 The main car park in Hexham is the Wentworth car park – postcode NE46 3PD. It is a short, but quite steep walk from the Wentworth Car Park to the Market Place. The map below also indicates the car parks a bit closer to the market. A disk parking system operates in Hexham. You can get disks from machines in car park or from a number of the local shops, priced £1. You can find more information about parking in Hexham on the Northumberland County Council website. There are a number of disabled parking bays in the centre of Hexham, including two in the Market Place itself. Hexham is well serviced by buses with regular services from a wide variety of outlying towns and villages. It is also one of the main stops on services between Newcastle and Carlisle. Hexham bus station is approximately a 10 minute walk from the Market Place. The easiest way to plan your visit to the market using the bus is to go to the Traveline North East website. Hexham is also on the trainline between Newcastle and Carlisle and there are regular services from all stations along this Tyne Valley railway operated by Northern Rail and some others. The railway station is also about a 10 minute walk to the centre of Hexham. The Traveline North East website again can help you plan your journey.